You’ve Come To The Right Place for Great BBQ! Preparing food baskets for Easter Volunteers Jamie, Lydia and Adam Raatz collect various food items as they assemble a special food basket for Easter during an event organized by the Centennial Community Food Shelf Saturday, April 13, at Our Savior’s Lutheran Church in Circle Pines. See more photos on page 10.
chaplain of the Lexington Fire Department (LFD), keeps the stuffed puppies and blankets in her car so that if she needs them on a call, they are close by. Lino Lakes resident Linda Ramnarine said she got the pattern for the stuffed dogs over 35 years ago. “I started making them for my kids, grandkids, nieces, nephews, friends and their kids,” she explained. For many years she stopped making them, until last year when she thought they would be a good addition to St. Mark's Holiday Bazaar in November. The Quad Community Press set out to find some adorable pets living right here in the Quad area. Where Good Folks Come For Great Food! Longtime elected offical Margaret Langfeld passed away April 6. CIRCLE PINES CITY COUNCIL NOTES The Circle Pines City Council took the following action at its April 9 meeting: • Heard from Mayor Dave Bartholomay, who reminded residents that Recycling Day will be from 8 a.m. to noon Saturday, April 27. • Announced that the design for the new City Hall playground has been selected. City Administrator Patrick Antonen said the playground replacement will be completed this summer along with some other upgrades to City Hall, such as the parking lot and lighting, in conjunction with the Centennial Library branch expansion. LEXINGTON CITY COUNCIL NOTES The Lexington City Council took the following action at its meeting on April 4: • Approved the consent agenda, which included council meeting minutes from March 21, claims and bills dealing with payroll, general fund and liquor payment, credit card payments and Centennial Lakes Police Department payment. • Approved the preparation of plans and specifications on improvements to Jackson Avenue, which is located between Restwood Road and Woodland Road. The improvements will include surface milling, placement of bituminous overlay and street repairs as needed. The costs of the improvements would likely be funded (in part) by benefiting property owners. still remember when one of my childhood friends made a big announcement: she no longer believed Santa Claus was real but she still believed in the Easter Bunny. While her thinking seemed illogical to me, I tried to understand where she was coming from. As for me, I never remembered believing Santa Claus was anything but a fun person in a suit. My theory about the Easter Bunny was built off my theory of Santa Claus. But for my friend, who had believed the Santa Claus story for years until she realized Santa Claus looked, sounded and acted differently at the mall every year, the Easter Bunny offered a more believable alternative. The Story Easter Bunny was rather elusive in the ‘90s. He didn’t show up at Chaser many community Easter egg hunts Sara Marie Moore like he does today. A child couldn’t see the Easter Bunny appears to be a person in a suit, so it could make sense the mysterious bunny ﬁ lled the ﬁelds overnight with plastic chicken eggs. I didn’t tell my friend but I was still convinced that the Easter Bunny was also a person in a suit. This week, millions of people around the world will celebrate the resurrection of Jesus, a man who was cruciﬁed about 2,000 years ago for claiming to be God in human form. The report of his resurrection is what has caused millions of people around the world to believe his claims to be God and build their lives around his teachings recorded by four ﬁrst-century reporters: Matthew, Mark, Luke and John. Over the centuries, several theories have surfaced to try to refute the reporting of Jesus’ resurrection, according to the “Handbook of Christian Apologetics” by Peter Kreeft and Ronald K. Tacelli. First, some people have theorized that Jesus did not really die on the cross but that he was simply revived after resting in the tomb. However, John reported that blood and water came from Jesus’ heart when it was pierced by those checking to make sure he was dead. Death by asphyxiation or hypovolemic shock would cause water to build up around the heart. Others say perhaps the disciples hallucinated that they saw Jesus after he died. However, people touched Jesus after he rose from the dead. He was consistent in his appearance and personality. He appeared to multiple individuals and groups for over a month. Group hallucinations are rare. Luke reported about 500 people saw Jesus at once after he was resurrected. When the Apostle Paul was spreading the report of the resurrection further west, he noted that many of these 500 were still alive, available for questioning. Another argument against the resurrection is that Jesus’ followers and the reporters created a conspiracy. It is not very plausible such a conspiracy could have been perpetrated considering how difﬁcult it would have been to take Jesus’ body from a guarded tomb and destroy the evidence so quickly. Conspiracies are usually found out, especially when a group has adversaries. It is doubtful that 3,000 people in the area would have become Christians within a couple of months if the resurrection had been made up. That a man named Jesus rose from the dead in the Middle East about 2,000 years ago is not really a disputed fact of history. Who you think he was, how and why he rose from the dead and what it means for your life is a matter of personal decision and faith. As for me, I still believe He was God in a human suit. If those reporters got the resurrection right, I believe they quoted Him accurately, too. Sara Marie Moore is editor of the Shoreview Press. She can be reached at 651-407-1235 or shoreviewnews@presspubs.com. the start they need today in this world, but lack the technology resources to enable them to happen. Peggy Noonan, a respected op-ed writer for the Wall Street Journal, pointed out two weeks ago that as Americans, we are best when we can unify around some common event. We can throw aside small differences to achieve an outcome that will beneﬁt and help us all to power ahead. The CAEF remains committed now and for years to come to help our community support education. Many of you already dedicate your own time and resources to our schools and other community organizations to this end. As a fellow community member, I thank you. We cannot, and should not, go back to the school in my memories, because our children are more precious than gold and they deserve our best. Jan Kreminski is the president of the Centennial Area Education Foundation. writer about the same subject • Deadline is 5 p.m. Wednesday six letters per year and at matter will not be published. of the week prior to publication. least four weeks must lapse between publication. • Submissions containing libel- • To submit a letter, e-mail it to Exceptions may be made for ous or derogatory statements quadnews@presspubs.com, rebuttal letters. will not be published. fax it to 651-429-1242 or • Due to space limitations, let- • Submissions containing facts mail or deliver it to: ters that don’t address local not previously published in the Press Publications issues are not guaranteed 4779 Bloom Ave. Press must be accompanied publication. White Bear Lake, MN 55110. by factual veriﬁcation. • Repeat letters by the same • All letters are subject to editing. BUSINESS BRIEFS Harbor Freight Tools to open new store in Blaine Harbor Freight Tools will celebrate the grand opening of its new store in Blaine at 8 a.m. Wednesday, April 24. The Blaine store is located at 11727 Ulysses Lane NE and is the 11th Harbor Freight Tools store in Minnesota. â&#x20AC;&#x153;Weâ&#x20AC;&#x2122;re excited to serve customers in the great city of Blaine,â&#x20AC;? said Dominick Wolter, store manager. â&#x20AC;&#x153;At Harbor Freight, weâ&#x20AC;&#x2122;re passionate about providing our customers with the tools they need to get the job done, and always at an affordable price. We look forward to welcoming auto technicians, contractors, woodworkers, homeowners, hobbyists â&#x20AC;&#x201D; anyone who needs affordable tools.â&#x20AC;? The 15,000-square-foot store will stock a full selection of tools and accessories in categories including automotive, air and power tools, storage, outdoor power equipment, generators, welding supplies, shop equipment, hand tools and more. The store will be open seven days a week from 8 a.m. to 8 p.m. Mondays through Saturdays, and from 8 a.m. to 6 p.m. on Sundays. visit http://www. bistrolaroux.com/ or find Bistro La Roux on Facebook. presenting donors April 11-30 will receive a commemorative â&#x20AC;&#x153;Bleed For The Throneâ&#x20AC;? poster while supplies last and automatically be entered in the abovementioned sweepstakes. For more information, visit redcrossblood. org or call 1-800-RED CROSS. Anoka County Senior Expo planned for April 27 Come celebrate healthy living during the Anoka County Senior Expo from 9 a.m. to noon April 27 at Lord of Life Church, 14501 Nowthen Blvd., Ramsey. The expo is an outreach event to all seniors in the area to inform them of the goods and services that are available to them as seniors. The free event is open to seniors and their families. Activities include information booths, free pancake breakfast, blood pressure checks, mini massages and entertainment. Ample parking is available, and the venue is handicapped accessible. The Alliance for a Violence Free Anoka County and Anoka County Human Services sponsor the event. For more information, contact Mary at 763-7603699. Harbor Freight Tools in Blaine will host a grand opening at 8 a.m. Wednesday, April 24. Harbor Freight Tools started in southern California in 1977, when 17-year-old Eric Smidt began transforming his fatherâ&#x20AC;&#x2122;s small phone sales business into a successful mail order company. The company opened its first store in 1980, and today Harbor Freight Tools has nearly 1,000 stores across the country, 20,000 employees and more than 40 million customers. For more information, visit harborfreight.com. organizations to receive a Neighborhood Health Connection grant from Allina Health. The grants, which range from $300 to $10,000, are part of Neighborhood Health Connection, a community program developed by Allina Health to improve the health of communities through social connections, healthy eating and physical activity. The Lino Lakes YMCA received a grant for five groups of people, including residents of a manufactured home park, that will meet weekly for exercise and nutrition classes in their neighborhoods or workplaces. someone is lying. Admission to the 60-minute event is free and snacks and beverages are provided. Lifetree CafĂŠ is located at 1 Shepherd Court, Circle Pines. Questions about Lifetree may be directed to Ann at 612-751-5707 or lifetreecafecpmn@ gmail.com. Pasta dinner St. Joseph of the Lakes Church will host its fourth annual pasta dinner from 4 to 7 p.m. Saturday, May 4. Proceeds from the event will benefit the Centennial High School boys lacrosse team. Tickets are $5 each or $20 for a family of five. The event will also include raffle baskets. St. Joe's is located at 171 Elm St., Lino Lakes. David Guenzel Retired pastor David Guenzel, 82, passed away Friday, April 5. Guenzel served at several parishes in ministry before retiring from Incarnation Lutheran in 1993. He and his wife Sharon began attending Living Waters Lutheran Church in Lino Lakes in 2010 and he joined the staff in 2011. Most recently, Guenzel served as the adult faith formation coordinator. A memorial gathering was held April 11 at Holcomb-Henry-Boom-Purcell Funeral home in Shoreview and a memorial service was held April 12 at Incarnation Lutheran Church in Shoreview. To make changes or to advertise here, call Jeanne at 651-407-1224 or email quad@presspubs.com. QUAD AREA EVENTS Event details are subject to change. Please contact the event organizer to verify information prior to attending. QUIET GARDEN RETREAT DAYS See Press Publications’ website www.presspubs.com for stories from the White Bear Press, The Citizen, Vadnais Heights Press, Shoreview Press, Quad Community Press, The Lowdown-Forest Lake Area and The Lowdown-St. Croix Valley Area. ‘ANIMAL FARM’ When: 7 p.m. Thursday, April 18; 7 p.m. Friday, April 19; 1 p.m. Saturday, April 20; 7 p.m. Wednesday, April 17 Where: Haniﬂ Performing Arts Center, 4941 Long Ave., White Bear Lake Details: Lakeshore player’s Kids and Family series performance about farm animals who drive out their master and take over the farm for themselves. Ideal for students in grades 6-12. Anyone in the community may send us news of an upcoming local event. The calendar is reserved for secular community events in or adjacent to Press Publication’s coverage area. Priority is given to free or affordable events that are likely to appeal to a broad audience. Publication of events is subject to editorial discretion. Due to space limitations, there is VICTORIAN TEA no guarantee whether, AT THE HISTORIC when or for how long COURTHOUSE submissions will be published. Submissions When: Noon-2 p.m. are subject to editing. Saturday, April 27 Please include date, Where: Historic Courthouse, 101 W. Pine time, location, cost, brief details, and conSt., Stillwater tact information for Details: Multi-course tea and program by the each event submission. Submission deadline is Minnesota Historical Wednesday prior to the Society. Tours. Reservations required. following weeks’ publication. Call 651-407-1226 Contact: co.washington. with questions. mn.us Online: www.presspubs.com/calendar STEM SATURDAYS: Email: calendar@ FUN-DAMENTAL presspubs.com FORCES Mail: Press PublicaWhen: 10-11 a.m. tions Saturday, April 27 Attn: Calendar Where: Hardwood Creek 4779 Bloom Ave. Library, 19955 Forest White Bear Lake, MN Road N., Forest Lake 55110 Details: Children 6-12 use Newton’s Laws of Motion to zing toy cars through gravity defying loops and experiment with a giant bike wheel gyroscope. made errors on base running plays. She out-dueled Sy’rai Trice, who pitched well for Osseo. Centennial placed third in the state last year, finishing 22-5 with 28 home runs in 27 games. Three of five allconference players returned, including MVP and top slugger Montero. Centennial’s Madeline Fidler tied the game 2-2 in the fifth when she singled, stole second and took third and home with aggressive base running and Osseo errors. Right: Abby Lohse beamed as she headed home on her game-winning home run for Centennial. Left: Alyssa Montero, returning team MVP, struck out 11 batters as she pitched the 3-2 win over Osseo. Respond electronically by e-mailing to art@presspubs.com and attach a .JPG of your hero, also include their name, branch of service, rank and where they were stationed. out five, walking just one. Jaxon Waldvogel finished with two shutout innings (two strikeouts). Garret Strating rapped a single and double in three trips. Minnesota Senate Leaders: End Elder Abuse Now Minnesota is the only state in the country that does not require assisted living facilities to be licensed. Reports of elder abuse, uncovered over two years ago, continue—and frail seniors remain at risk. AARP urges you to protect Minnesota’s frail seniors by passing strong and sufficiently funded legislation this session that will require assisted living facilities to be licensed—and will stop these facilities from discharging seniors without adequate notice or cause, retaliating against seniors and their families, and ongoing deceptive marketing practices. It’s time for a bipartisan solution. Our seniors can’t wait. Get offline and get in line! High School & College students coming by bus! Learn more about job opportunities available where you live! Meet representatives from employers and organizations looking for candidates for a range of job opportunities from full-time, part-time, seasonal, and volunteer positions! Top: Volunteers prepare to distribute food to families in need at Our Savior’s Lutheran Church in Circle Pines Saturday, April 13. Centennial HIgh School Sophomore Class Committee volunteers Olivia Ferguson, Emmalee Eslinger, Grace Aclerman, Abby Zimmerman, Jenna Hogstad, Sabrina Francis and Brooke Willenbring pose near some staple food items prior to the food basket assembly. Other organizations represented at the event included Central Lutheran Church, National Honor Society, Gethsemane United Methodist Church, Metro Dance Team, Eagle Brook Church, Boy Scout Troop 432, Second Harvest and Service Club. Suitable for entry-level, new grads, professional careers, seasoned experts, returning to the job market, or looking to make a transition! In addition to meeting employers and organizations, take advantage of resources and services to improve your success! and the little boy was having a really tough time, so I went out to the car and grabbed a puppy and blanket for him. He just hung on to it,” she recalled. The puppies and blankets help Clearance provide some comfort. “That is really one of the primary responsibilities that I do, is provide some comfort care, whether it is listening or if they want prayer ... If they are hurting or crying, I can give them something to focus their attention on, something they can love up in time of tragedy,” she said. “I do want to reach out more to the community rather than just as the chaplain going out on recovery calls.” In addition to LFD, the stuffed puppies and blankets are also given to those in need who come into contact with the Centennial Fire District and Centennial Lakes Police Department. Individuals from all three organizations showed up to the quilter group's recent get-together April 9 to do their part. Firefighters and officers helped the quilters at various stations. Those stations included admitting — when the pups get ready to be stuffed; transplant — when the dogs are filled with stuffing; sutures — when the dogs are stitched up after being stuffed; mating — when the dogs are paired with a matching blanket; and, finally, recovery — when both the pups and the humans take some time to rest and enjoy a cookie. Editor Shannon Granholm can be reached at 651-407-1227 or quadnews@presspubs.com. Above lleft: Retired Lexington Fireﬁ ghter (1994 (1994-2017) Ab ft R ti d L i gt Fi ﬁght 2017) Bradley Gavin helped St. Mark’s quilters assemble stuffed puppies at quilting stations that included “admitting,” “transplant” and “suture” activities. Above right: Lino Lakes resident Linda Ramnarine got the pattern for the stuffed dogs over 35 years ago. St. ed St Mark Lutheran Church’s quilting group has made around 15 stuff stuffed puppies and blankets to give out to children during times of tragedy. Quilter Ginny Hestekind teaches Centennial Lakes Police Officer Andy Dixon how to sew at the “suturing” station. r u o H y p p Ha Special highlighted here! Call 651-407-1200 to place your ad here! firefighters Mindy Fiester Fiester, James Heck and Scott Assistant Chief Vanderbloomer and firefighters Parenteau practice bandaging an injury. Firefighter James Heck feels for a pulse on the femoral artery on the Firefighter dog’s hind leg. Assistant Chief Mark Vanderbloomer and firefighter James Heck listen to instructions from teacher Heather Bogie, a senior research surgeon lead with Data Sciences International. Pictured are firefighters James Heck and Mindy Fiester. Here, Fiester gives the dog some love after administering lifesaving measures. she said. “Simply, this should be an equal opportunity for all six commissioners to decide who we think the best person for the job is.” Schulte said, “It is not the measure of the board whether you disagree or have different thoughts. When there is a separation as there was at the previous board meeting, the measure is how you get past that, how you compromise, how you come to a conclusion and how you work together in subsequent years. That is the measure of character, the measure of how a board functions. I think we are strong from that capacity and I think we will come back from this and be stronger and better than ever.” Gamache said he guesses the interviews will take place the last week of April or first week of May. “The committee will bring a suggestion (or suggestions) to the full board and the full board will make the final decision. Jerry has agreed to stay on into May, so we should have someone hired before Memorial Day,” he said. Editor Shannon Granholm can be reached at 651-407-1227 or quadnews@presspubs.com. Lino Lakes Captain William Owens and Deputy Director Kyle Leibel recognize volunteer Russ Ellenwood for 10 years of service to CERT. ordinance amending City Code Section 1007 to allow for multiple buildings on a single parcel in Commercial, Industrial and Public/Semi Public Zoning Districts. Community Development Director Michael Grochala explained current city ordinance only allows for one principal building per lot, and in commercial and industrial zoning districts the size of accessory buildings is limited to 400 square feet. Therefore, any expansion project, which requires an additional building in excess of 400 square feet, would require approval of a planned unit development (PUD). Grochala said for a single-use site, approval for multiple buildings would be more appropriately handled through a conditional use permit (CUP). The ordinance was approved. • Held the second reading of an ordinance amending City Code Section 1007 to allow for retaining walls greater than 42 inches height. Grochala said currently the city requires a zoning permit for the construction of retaining walls within platted areas of the city and prohibits walls over 48 inches. The current state building code has provisions for walls taller than 48 inches. The amendment allows walls up to 48 inches in height, but a zoning permit would still be required. The ordinance was approved. • Accepted bids, awarded a construction contract and approved a construction services contract for the 2019 mill and overlay project. The project includes Sherman Lake Road, Merganser Court, Sherman Lake Court, Sherman Lake Circle, Fire Station No.1 parking lot, Deerwood Lane (Fox Road to the south cul-du-sac) and Pheasant Hills Drive. Seven bids were received for the project. The low bidder was North Valley Inc. for $546,810. WSB will complete construction services for $39,028. The project will be funded through the pavement management fund and construction is scheduled for completion by October. The Lino Lakes City Council accepted bids and awarded a construction contract for $119,315 to Dunaway Construction for Woods Edge Park at its April 8 meeting. Thank You God and Saints Philomena and Pio for favors received! Residential Heating, Cooling, Service and Repair. Chisago County has an opening for Parks Director. Performs administrative and supervisory work involving the management, development, maintenance, and operations of the county parks and trails system consisting of two regional trails, five county parks, and one designated preserve land area. Directs lead and seasonal parks maintenance staff and manages seasonal park rangers and park attendants. Manages and staffs the appointed County Park Board providing operational and park management reports and recommendations that foster proactive parks policy input, development, direction, and recommendations from this County Board appointed body. Desired qualifications: Bachelor's degree in Recreation & Parks Management, or related public administration field, Three (3) years parks administration or project management; Natural resource management, landscaping and turf care experience; Certifications in or ability to obtain Private Pesticide Applicator, Playground Safety Inspector, Red Cross Water Rescue, and First Aid and CPR. $26.93 $37.03 DOQ. Deadline: April 26, 2019. Apply at www.chisagocounty.us or call 651213-8869 to have an application mailed. Dog Training For more details visit: www.dogtrainingby tiffany.com or call to set up a free evaluation 612-978-3612 Dog Training by Tiffany LLC a local company that specializes in private one on one dog obedience training at a time that fits your schedule. CLEANING PARK MAINTENANCE Seasonal Chisago County has FT and PT openings for seasonal Park Maintenance positions. Job Duties: Experience in grounds maintenance and related skills are necessary. Operation of riding mowers and power tools. Responsible for grounds keeping in the Chisago County Parks. Must be 18+ years of age with a valid driver's license. Applicants must be available to work through Labor Day. Apply at www.chisagocounty.us or call 651213-8869 to have an application mailed. PARK RANGER Seasonal Chisago County has an opening for a seasonal Park Ranger. Job Duties: Maintain control for the park. Provides user information to improve Park safety. Provides education on Park ordinances. Provide CPR/First Aid as needed. Opens and monitors restrooms and park shelters. Maintenance of the park and beach areas. Applicants must be available to work through Labor Day. $15 per hour. Apply at www.chisagocounty.us or call 651-213-8869 to have an application mailed. Has great opportunities for students and others seeking employment. In search of men and women for Full & Part Time positions. You can secure employment throughout your school career and solve the yearly job search. $14/hr with season ending incentive bonus program. Part Time opportunities while in school when schedule allows. Weekend work only on a voluntary basis. Please call Bill @ 651-490-9755 or email to amilawn@aol.com to discuss opportunities and schedule an interview. Administrative Interns Wanted White Bear Township is accepting applications for two temporary part-time interns to assist in general administration duties from June 1, 2019 to August 15, 2019. This position will handle miscellaneous administrative and clerical duties and special projects as assigned. Everything you have always dreamed of in a comfortable and gracious setting. WE ACCOMODATE YOUR SPECIAL EVENT – OFF SITE CATERING – Reserve today! Commercial auto floor scrubber, needed for small shop, it needs to work. GROUNDS KEEPING Seasonal Chisago County has an opening for a seasonal grounds keeper. Hours of work will be M-F 7:00 to 3:30. Must be 18+ to apply and have a driver's license. Previous grounds keeping experience is desired. Majority of the work is outdoors. Deadline to apply is April 21, 2019. $13.50 per hour no benefits 40 hours per week. Apply at www.chisagocounty.us or call 651-213-8869 to have an application mailed. Employment â&#x20AC;˘ Employment â&#x20AC;˘ Employmentâ&#x20AC;˘ Employment HIGH SCHOOL PRINCIPAL New LondonSpicer Schools. High School Principal License required. See www.nls.k12.mn.us/ employment for more information. MAINTENANCE WORKER The City of Mahtomedi has openings for up to (1) full time Seasonal Maintenance Worker positions. This position is for 67 days. Duties include assisting the Public Works Department with street, water, sewer, and park maintenance. Must have a High School diploma or GED, the ability to lift/move 25-100 Lbs., be at least 18 years old and have a valid driver's license. The pay range is from $11.00/hr. to $14.00/hr. depending on qualifications. Applications will be taken until 4:30 PM, Thursday, May 9, 2019. Chisago County has an opening for a seasonal Park Collection Attendant. Job Duties: Provide visitor information at Fish Lake Park, collection of parking fees, deposits and conducts surveys. Must be good with people and have math skills. Opens restrooms, cleans and ready the restrooms and park shelter. Post shelter reservations. Must be 16+ years of age. Weekends and Holidays. Applicants must be available to work through Labor Day. Apply at www.chisagocounty.us or call 651213-8869 to have an application mailed. The City of Lexington is accepting applications for a part-time, seasonal Public Works Maintenance Worker to assist in regular and recurring maintenance, installation and repair work associated with the city's parks and buildings. Three (3) days per week for six (6) hours per day, starting 2 weeks before Memorial Day and ending 1 week after Labor Day. Position pays $13.00/hour, starting. A valid driver's license with a clean driving record is essential. Applications available Monday Friday, 8 am 4:30 pm, at Lexington City Hall, 9180 Lexington Ave, Lexington, MN 55014 or online at http://www.ci.lexington.mn.us/. Applications must be received by 4:30 p.m. May 3, 2019, Lexington City Hall. L allier CONCRETE , INC .
At Lâ&#x20AC;&#x2122;allier Concrete we pride ourselves on taking concrete services to the next level â&#x20AC;&#x201C; providing customized solutions to fit the demands of our clients and their projects. We encourage you to contact us to discuss your concrete project. Owner Jeremy Lâ&#x20AC;&#x2122;Allier has been in the construction business as long as he can remember, getting his start in the family business, Lâ&#x20AC;&#x2122;allier Construction. In 1997 he founded Lâ&#x20AC;&#x2122;allier Concrete. His talent and hard work have earned a reputation that is second to none. We continue to grow based on referrals, word of mouth and repeat business from satisfied customers. Lâ&#x20AC;&#x2122;allier Concrete has completed hundreds of projects for homeowners, independent school districts, government, and private corporations. LCONCRETE allier , INC .
Rivard Cement Contracting Quality Comes First â&#x20AC;˘ We do it All! Itâ&#x20AC;&#x2122;s never too late to ďŹ x that old chimney. Isnâ&#x20AC;&#x2122;t it time for a healthier life? Call Dr. David Wick to experience what a natural healing approach can do for you! 651-780-9031 RivardConcrete.com All major credit cards accepted. Donâ&#x20AC;&#x2122;t delay, call today to schedule your FREE estimate!! How Do You Choose a RooďŹ ng & Siding Contractor? Master Plumber â&#x20AC;˘ 35 Years Exp. â&#x20AC;&#x153;For all your projects & repairs, big or small, give Dan a callâ&#x20AC;? Time to remodel the family room? Ready to update a kitchen or bathroom? What about that addition you have always wanted? We can take the dream and make it reality! For Expert Installation . ..
CENTENNIAL SCHOOL DISTRICT NO.12 CALL FOR BIDS CENTENNIAL SPORT ARENA – ADDITION AND REMODEL Centennial School District No. 12 will receive sealed bids in duplicate for: Centennial Sport Arena – Addition and Remodel– until 11:00 am on Wednesday, May 8, 2019. Bids will be received by the Executive Director of Business Services – Patrick Chaffey at the 4707 North Road Circle Pines, MN 55014 then publicly opened and read aloud. There is no agent for the receipt of bids other than the Executive Director of Business Services – Patrick Chaffey. Bids shall be submitted on bid form provided by the Bid Documents. The completed bid form shall be submitted without alterations, additions or erasures. Envelopes containing bids must be sealed marked separately “Centennial Sport Arena – Addition and Remodel” with the name and address of the bidder, Work Scope number and Title being bid, date and hour of the opening. Bids shall be delivered to: Executive Director of Business Services – Patrick Chaffey Centennial School District No. 12 District Ofﬁce 4707 North Road Circle Pines, MN 55014 Lump sum bids for the deﬁned work scope are solicited from responsible contractors specializing in, or highly experienced in this work. Procurement of documents: Franz Reprographics 2781 Freeway Blvd Brooklyn Center, MN 55430 Phone: 763-501-3401 www.franzrepro.com Bidding documents will be available on or about April 15, 2019. Each bid of $10,000 or greater shall be accompanied by a certiﬁed or cashier’s check, or a bid bond in the amount of at least ﬁve (5%) percent of the amount of the bid made payable to Centennial School District No. 12 as bid security that, if the bid is accepted, the contractor will execute the contract and ﬁle the required performance and payment bonds within the allotted time period after notice of award of contract. A pre-bid conference will be held on Wednesday April 24, 2019 at 3:30 pm at the Centennial Sports Arena 4807 North Road Circle Pines, MN 55014 The Board of Education reserves the right to accept or reject any or all bids or parts of bids and waive any formalities or irregularities in the bidding. No bid may be withdrawn for a period of forty-ﬁve (45) days after bid opening without consent of the Board of Education. Centennial School District No. 12 4707 North Road Circle Pines, MN 55014 Published two times in the Quad Community Press April 16 and 23, 2019. CENTENNIAL SCHOOL DISTRICT NO.12 CALL FOR BIDS DISTRICT GROUNDS BUILDING Centennial School District No. 12 will receive sealed bids in duplicate for: Centennial School District – District Grounds Building, until 1:00 pm on Wednesday, May 8, 2019. Bids will be received by the Executive Director of Business Services – Patrick Chaffey at the 4707 North Road Circle Pines, MN 55014 then publicly opened and read aloud. There is no agent for the receipt of bids other than the Executive Director of Business Services – Patrick Chaffey. Bids shall be submitted on bid form provided by the Bid Documents. The completed bid form shall be submitted without alterations, additions or erasures. Envelopes containing bids must be sealed marked separately “Centennial School District – District Grounds Building” with the name and address of the bidder, Work Scope number and Title being bid, date and hour of the opening. Bids shall be delivered to: Executive Director of Business Services – Patrick Chaffey Centennial School District No. 12 District Ofﬁce 4707 North Road Circle Pines, MN 55014 Lump sum bids for the deﬁned work scope are solicited from responsible contractors specializing in, or highly experienced in this work. Procurement of documents: Franz Reprographics 2781 Freeway Blvd Brooklyn Center, MN 55430 Phone: 763-501-3401 www.franzrepro.com Bidding documents will be available on or about April 15, 2019. Each bid of $10,000 or greater shall be accompanied by a certiﬁed or cashier’s check, or a bid bond in the amount of at least ﬁve (5%) percent of the amount of the bid made payable to Centennial School District No. 12 as bid security that, if the bid is accepted, the contractor will execute the contract and ﬁle the required performance and payment bonds within the allotted time period after notice of award of contract. A pre-bid conference will be held on Wednesday April 24, 2019 at 3:30 pm at the Centennial Sports Arena 4807 North Road Circle Pines, MN 55014 The Board of Education reserves the right to accept or reject any or all bids or parts of bids and waive any formalities or irregularities in the bidding. No bid may be withdrawn for a period of forty-ﬁve (45) days after bid opening without consent of the Board of Education. Centennial School District No. 12 4707 North Road Circle Pines, MN 55014 Published two times in the Quad Community Press April 16 and 23, 2019. Lump sum bids for the deﬁned work scope are solicited from responsible contractors specializing in, or highly experienced in this work. Procurement of documents: Franz Reprographics 2781 Freeway Blvd Brooklyn Center, MN 55430 Phone: 763-501-3401 www.franzrepro.com Bidding documents will be available on or about April 15, 2019. Each bid of $10,000 or greater shall be accompanied by a certiﬁed or cashier’s check, or a bid bond in the amount of at least ﬁve (5%) percent of the amount of the bid made payable to Centennial School District No. 12 as bid security that, if the bid is accepted, the contractor will execute the contract and ﬁle the required performance and payment bonds within the allotted time period after notice of award of contract. A pre-bid conference will be held on Wednesday April 24, 2019 at 3:30 pm at the Centennial Sports Arena 4807 North Road Circle Pines, MN 55014 The Board of Education reserves the right to accept or reject any or all bids or parts of bids and waive any formalities or irregularities in the bidding. No bid may be withdrawn for a period of forty-ﬁve (45) days after bid opening without consent of the Board of Education. Centennial School District No. 12 4707 North Road Circle Pines, MN 55014 Published two times in the Quad Community Press April 16 and 23, 2019. CITY OF CENTERVILLE PUBLIC HEARING NOTICE NOTICE IS HEREBY GIVEN that the Planning and Zoning Commission of the City of Centerville, Minnesota will meet and consider input regarding proposed rezoning of certain properties along Main Street from B-1 (Commercial) to B-2 (Main Street Commercial). The B-2 (Main Street Commercial) district would be added to City Code 156.030 through a text amendment, additional text amendments to the B-1 (Commercial) district and an amendment to Table 156-A.1, District Allowed Uses. This rezoning intends to address the differences in appropriate land use between commercial properties on and off of Main Street. The following properties would be affected by this rezoning: 1801 (PIN #23-31-22-12-0006), 1825 (PIN #23-31-22-12-0007), 1845 (PIN #23-31-22-12-0091), (PIN #23-31-22-12-0092), 1873 (PIN #23-31-22-120093), 1969 (PIN #23-31-22-11-0004), 1970 (PIN #23-31-22-14-0026), 1973 (PIN 23-31-22-11-0006), 1976 (PIN #23-31-22-11-0005), 1979 (PIN #23-3122-11-0003), 1980 (PIN #23-31-22-14-0003), 1981 (PIN #23-31-22-11-0002), 1988 (PIN #23-31-22-14-0075), 1990 (PIN #23-31-22-14-0018), 2030 (PIN #24-31-22-23-0008), 2050 (PIN #24-31-22-23-0009), (PIN #24-31-22-230010) Main Street, 7090 (PIN #24-31-22-23-0005), 7105 (PIN #24-31-22-220215), 7140 (PIN #24-31-22-22-0002) – 20th Avenue and (PIN #24-31-2223-0010) & 7095 (PIN #24-31-22-23-0011), 7111 (PIN #24-31-22-22-0216) – 21st Avenue. The Commission will meet on May 7, 2019, commencing at 6:30 p.m. in Council Chamber of City Hall located at 1880 Main Street, Centerville, MN 55038. The City Hall is ADA accessible. Requests for hearing assisted devices or a sign language interpreter must be received before 4:00 p.m., May 3, 2019. All persons interested are invited to attend and to be heard, verbally or in writing. You may call City Hall at (651) 429-3232 if you have any questions. Teresa Bender, CMC Published one time in the Quad Community Press on April 16, 2019. CITY OF LINO LAKES COUNTY OF ANOKA ORDINANCE NO. 05-19 AN ORDINANCE AMENDING CITY CODE SECTION 1007 RELATED TO MULTIPLE BUILDINGS ON A SINGLE LOT IN COMMERICAL, INDUSTRIAL AND PUBLIC AND SEMI-PUBLIC ZONING DISTRICTS The City Council of Lino Lakes ordains: Section 1. Findings. The City Council ﬁnds that the allowance of two or more principle or accessory buildings on a single lot may be appropriately regulated through the Conditional Use Permit process when such buildings relate to a single business or enterprise. Section 2. Amendment. Lino Lakes City Code Chapter 1007.042 (4) is hereby amended as set forth below: (b) Principal Buildings. Except in Commercial, Industrial and Public/SemiPublic zoning districts, where allowed by Conditional Use Permit, and in an approved planned unit development that speciﬁcally allows it, provided for in §1007.024 of this Ordinance, not more than one (1) principal building shall be located on a lot”. Section 3. Amendment. Lino Lakes City Code Chapter 1007.043(4) (J) is hereby amended as set forth below: 1. Except in Commercial, and Industrial zoning districts, where allowed by Conditional Use Permit, and in an approved planned unit development that speciﬁcally allows it, provided for in §1007.024 of this Ordinance not more than Only one (1) accessory building shall be allowed not to exceed four hundred (400) square feet except when intended for storage of buses Section 4. Amendment. Lino Lakes City Code Chapter 1007.112, GB, General Business District, (8) Conditional Uses is hereby amended as set forth below: (o) Two (2) or more buildings on same lot provided such buildings relate to a permitted or conditional use that is operated as a single business or enterprise. Section 5. Amendment. Lino Lakes City Code Chapter 1007.120 LI, Light Industrial District, (9) Conditional Uses, is hereby amended as set forth below: (g) Two (2) or more buildings on same lot provided such buildings relate to a permitted or conditional use that is operated as a single business or enterprise. Section 6. Amendment. Lino Lakes City Code Chapter 1007.121, GI, General Industrial District, (9) Conditional Uses, is hereby amended as set forth below: (j) Two (2) or more buildings on same lot provided such buildings relate to a permitted or conditional use that is operated as a single business or enterprise. Section 7. Amendment. Lino Lakes City Code Chapter 1007.130 PSP, Public and Semi-Public District, (8) Conditional Uses, is hereby amended as set forth below: (c) Two (2) or more buildings on same lot provided such buildings relate to a permitted or conditional use that is operated as a single business or enterprise. Section 8. Effective Date. This Ordinance shall be effective from and after its passage and publication according to the Lino Lakes City Charter. Passed by the Lino Lakes City Council this 8th day of April 2019. Jeff Reinert, Mayor ATTEST: Julianne Bartell, City Clerk. Published one time in the Quad Community Press April 16, 2019. CITY OF LINO LAKES COUNTY OF ANOKA ORDINANCE NO. 06-19 AN ORDINANCE AMENDING CITY CODE SECTION 1007 ALLOWING FOR CONSTRUCTION OF RETAINING WALLS GREATER THAN 42” IN HEIGHT The City Council of Lino Lakes ordains: Section 1. Findings. The City Council ﬁnds that the construction of retaining walls greater than 42” in height are regulated by the State Building Code and therefore it is not necessary to prohibit construction thereof. Section 2. Amendment. Lino Lakes City Code § 1007.001 (2) Deﬁnitions is amended as follows: RETAINING WALL. A wall not laterally supported at the top that resists lateral soil load and other imposed loads. Section 3. Amendment. Lino Lakes City Code § 1007.043 (18) is proposed to be amended as follows: (a) Permit Required. It is unlawful for any person hereafter to construct or cause to be constructed or erected within the platted areas of the City, any fence or wall without ﬁrst making an application for and securing a permit. Section 4. Amendment. Lino Lakes City Code § 1007.043 (18)(c) 4. is proposed to read as follows: h. No fence or wall shall be located within a drainage or utility easement without written permission of the Zoning Administrator City Engineer and the ﬁling of an encroachment agreement. Section 5. Effective Date. This Ordinance shall be effective from and after its passage and publication according to the Lino Lakes City Charter. Passed by the Lino Lakes City Council this 8th day of April 2019. Jeff Reinert, Mayor ATTEST: Julianne Bartell, City Clerk Published one time in the Quad Community Press April 16, 2019. STATE OF MINNESOTA COUNTY OF RAMSEY DISTRICT COURT SECOND JUDICIAL DISTRICT PROBATE DIVISION COURT FILE NO. 62-PR—19-242 ESTATE OF NOTICE AND ORDER FOR HEARING ON PETITION FOR DESCENT OF PROPERTY Estate of Paul H. Kirchoff, Decedent. A Petition for Determination of Descent has been ﬁled With this Court. The Petition represents that the Decedent died more than three years ago, leaving property in Minnesota and requests the probate of Decedent’s last Will, if any, and the descent of such property be determined and assigned by this Court to the persons entitled to the property. Any objections to the Petition must be ﬁled With the Court prior to or raised at the hearing. If proper, and no objections are ﬁled or raised, the Petition may be granted. Any Charitable beneﬁciary may request notice of the probate proceeding be given to the attorney general pursuant to Minnesota Statute Section 501B.41, Subdivision 5. IT IS ORDERED and Notice is further given, that the Petition Will be heard 0n May 7, 2019 at 9:00 a.m. by this Court at 15 West Kellogg Boulevard, Courtroom 1670, St. Paul, Minnesota 55102. IT IS FURTHER ORDERED that notice shall be given by publishing this Notice and Order as provided by law and by mailing a copy of this Notice and Order at least 14 days prior to the hearing date to all interested persons and persons Who have ﬁled a demand for notice. BY THE COURT Dated: March 29, 2019 Michael F. Upton, Court Administrator Kimberly Smith, Deputy Court Administrator Stephen L. Madsen, Esq. Attorney for Petitioner 190 Midtown Commons 2334 University Avenue Saint Paul, MN 55114 (651) 645-0511 Published two times in the Quad Community Press on April 9 and 16, 2019. STATE OF MINNESOTA COUNTY OF ANOKA DISTRICT COURT TENTH JUDICIAL DISTRICT PROBATE DIVISION COURT FILE NO. 02-PR-19-166 NOTICE OF INFORMAL PROBATE OF WILL AND APPOINTMENT OF PERSONAL REPRESENTATIVE AND NOTICE TO CREDITORS Estate of Laurence John Svendsen, Decedent Notice is given that an application for informal probate of the Decedents Will, dated 2-17-1998 ( WILL ), has been ﬁled with the Registrar. The application has been granted. Notice is also given that the Registrar has informally appointed Steven L. Svendsen, whose address is 5970 Portland Ave., White Bear Lake, Minnesota, 55110, as personal representative of the Estate of the Decedent. Any heir, devisee or other interested person may be entitled to appointment as personal representative or may object to the appointment of the personal representative. Unless objections are ﬁled with the court (pursuant to Minnesota Statutes section 524.3-607) and the Court otherwise orders, the personal representative has full power to administer the Estate, including, after 30 days from the date of the issuance letters, the power to sell, encumber, lease or distribute real estate. Any objections to the probate of the Will or appointment of the Personal Representative must be ﬁled with this court and will be heard by the Court after the ﬁling of an appropriate petition and proper notice of hearing. Notice is also given that (subject to Minnesota Statutes section 524.3801) all creditors having claims against the Estate are required to present the claims to the personal representative or to the Court Administrator within four months of this Notice or claims will be barred. 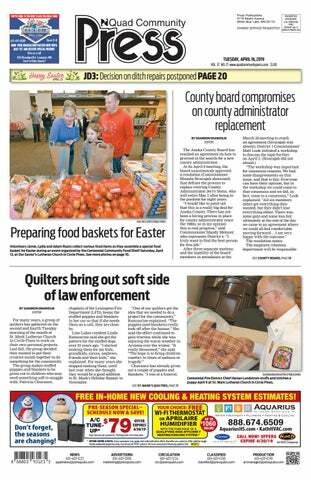 Dated: April 9th, 2019 Peggy Zdon, Registrar Lori O’Brien, Court Administrator Self Represented Litigant: Steven L. Svendsen 5970 Portland Avenue White Bear Lake, Minnesota 55110 Published two times in the Quad Community Press on April 9 and 16, 2019. Deadlines: White Bear Press, Vadnais Heights Press, Washington County Lowdown. By 5:00 p.m. Thursday prior to publication date. Quad Community Press, Shoreview Press, The Citizen. By 5:00 p.m. Wednesday prior to publication date. 4779 Bloom Ave., White Bear Lake, MN 55110, www.presspubs.com, 651-407-1200 • Monday – Friday 8 a.m. – 5 p.m.
Brought to you by WeathermanWatson.com Frank Watson is a local Meteorologist who operates a weather station in White Bear Lake. Weather data and observation are from his weather station and trips around the area. Frank can be found on the internet at WeathermanWatson.com. [THEMATIC MATERIAL AND SOME VIOLENCE] — After a fire closes the African-American school in Durham, North Carolina in 1971 and a NAACP leader (Babou Ceesay) SUNRISE / SUNSET WEATHER TIDBIT WEEKLY AVERAGES holds a two-week summit to decide Many of you, like my neighbor Maggie, had put away your APRIL 17 - 23, 2019 whether to integrate schools in this Wed Apr. 17 6:25 8:02 snow shovel for the winter. Last Wednesday around noon I High 61° powerful, inspirational, star-studded saw her taking it out. Last week I totaled 8.1 inches of snow, Low 38° (Nick Searcy, Wes Bentley, Bruce McGill, Thu Apr. 18 6:23 8:03 ice and hail. Unlike Maggie, I refused, REFUSED to take my shovel out. Yes, the first couple of days driving through the Caitlin Mehner and John Gallagher Jr.) %Sun 56% Fri Apr. 19 6:21 8:04 snow was tough. I had to blast through the snowplowed bank 133-minute film based on Osha Gray PCP 0.89” Davidson’s novel “The Best of Enemies: Sat Apr. 20 6:19 8:06 at the end of the driveway, but I did it. Most likely, other than maybe a few fl akes, that will be the last of our snow. White Race and Redemption in the New Sun Apr. 21 6:18 8:07 Bear Lake level update: November 15, 2018, 924.0 feet. South,” tenacious African-American April 15, 2019, 924.8 feet. civil rights and fair-housing activist Mon Apr. 22 6:16 8:08 Ann Atwater (Taraji P. Henson) with a teenage daughter (Nádej Kyla Bailey) Tue Apr. 23 6:14 8:09 and Ku Klux Klan leader and gas station owner C.P. Ellis (Sam Rockwell), who has a wife (Anne Heche) and three children (McKenzie Applegate, Brody Rose and Carson Holmes), eventually and surprisingly find themselves developing a friendship while coming together on common ground on the April 26, 1986 was when the issue of school integration. “SHAZAM!” (PG-13) [INTENSE SEQUENCES OF ACTION, LANGUAGE, AND SUGGESTIVE MATERIAL] — After a 14-year-old, orphaned boy (Asher Angel), who lives with his new foster parents (Marta Milans and Cooper Andrews) and five other kids (Grace Fulton, Jack Dylan Grazer, Faithe Herman, Ian Chen and Jovan Armand) in a group home in Philadelphia, learns that he can turn into an adult superhero (Zachary Levi) with magical superpowers in this action-packed, family-oriented, humorous, coming-of-age, star-studded (Djimon Hounsou, Meagan Good, John Glover, and Adam Brody) 132-minute fantasy film, he finds himself battling an evil doctor (Mark Strong) and seven deadly sins who want his magical powers. Chernobyl nuclear plant in the Ukraine exploded. The radioactive cloud created forced a 300-mile radius to be evacuated. Published one time in the Quad Community Press on April 16, 2019. Chief James Coan recognizes Officer Officer Brian Goetzke for his efforts during a medical call in Centerville in December. Goetzke, who received a lifesaving award, assisted by providing rescue breathing for an unresponsive adult female patient to whom Narcan was ultimately administered by ambulance personnel. The patient became responsive at the scene. Officer Nolan Wahlberg receives a lifesaving award for his actions on a medical call last December. Officer December Wahlberg responded to a medical call involving an adult female patient who was unresponsive. He provided rescue breathing for and Narcan to the patient, who then became responsive at the scene. The Centennial Lakes Police Governing Board, along with Police Chief James Coan, gives lifesaving awards to Officer Nolan Wahlberg, Sgt. Matt Giese, Officer Brian Goetzke and Officer Benjamin Stepan at its April 8 meeting. In March, the four responded to a call of an unresponsive male in Circle Pines. The officers provided rescue breathing and administered Narcan to the patient, reviving him at the scene. Much of Judicial Ditch 3 (JD3) in Anoka and Washington County is overgrown and needs to be repaired. He later writes, “H.F. 2314 and S.F. 2372 provide for additional oversight of the activities of the watershed, ensuring that residents of the county pay into the watershed benefit directly from its activities. We understand that watershed projects, regardless of where they are undertaken, have benefit to the entire watershed. However, we also believe that it is not unreasonable to assure that Washington County taxpayers get direct benefits as well for their tax dollars.” Both bills also state that the RCWD would be required to annually report the amount of money the district collects in Washington County through special assessments and ad valorem taxes as well as the amount spent on projects in the county to the Washington County Board of Commissioners. The final decision of the JD3 project will be postponed until the district can review the implications of the legislation or until the district’s existing budget methods are upheld. The legislation could also be withdrawn, fail or be vetoed. Editor Shannon Granholm can be reached at 651-407-1227 or quadnews@presspubs.com. RCWD is proposing to make repairs to Judicial Ditch 3, however the project has been put on hold due to the introduction of new legislation that could affect how the project is funded. 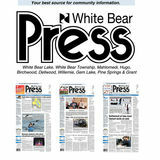 Weekly newspaper covering Lino Lakes, Circle Pines, Lexington and potions of Blaine.